Headed to Costa Rica? Congrats! You are in for an adventure. If you’re considering a rental car, check out these 5 tips on renting a car in Costa Rica. These tips will help you find the right car and hopefully avoid companies with questionable business practices. Tip 1: Know Your Route! Roads in Costa Rica can go from paved city street to off-road adventure in a matter of miles. It pays to plan your route in advance to get a better idea of the type of terrain you’ll be facing. For example, the drive from the airport in San Jose to Manuel Antonio is well paved and you would have no problems with a compact sedan. We met many travelers getting around with ease in a Yaris. However, if you’re headed to Montezuma or nearby areas, you will need a 4×4. Tip 2: Do You REALLY Need a Rental? 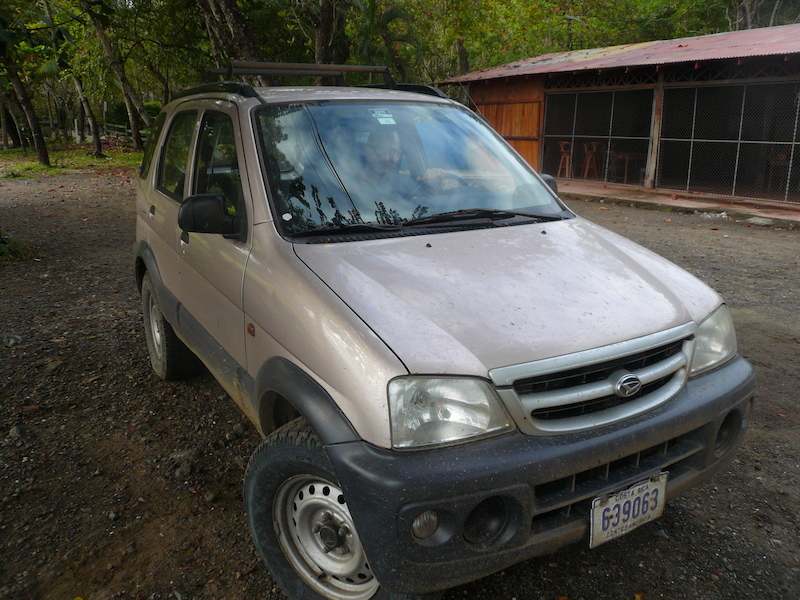 If you are going to one or two places in Costa Rica, a rental may not be the best option. There are many shuttle services available between major cities and taxis are abundant for getting around. Can you drive a manual car? If the answer is no, you may want to consider a shuttle service. Rentals with automatic transmissions are harder to find and cost more to rent. Read up on the rental company before you book. Some rental companies in CR share the same name as large car rental companies in the U.S., but their business practices are questionable. Don’t get caught with hidden fees and outrageous currency conversions. We found Wild Rider through TripAdvisor and would recommend them to anyone looking to rent 4×4’s and motorcycles. Before you book, call or email the rental company to confirm the prices, fees, coverage and everything else listed on their website. This is also a good time to tell them your route and ask for their recommendation on the best rental car for your trip. Once you’re satisfied, make sure to arrange for pick up at the airport (usually for a fee) or figure out the best way to get to their location. Also make sure they provide maps for getting around. Insider’s tip – If you speak Spanish, the buses in San Jose are a cheap way to get around. However, if you don’t know Spanish the busses are also a cheap way to get lost in the middle of the city. You will need insurance coverage in CR so make sure it’s part of your rental. The roads can get pretty rough depending on your route. To set your mind at ease, we suggest the additional zero detectable supplement just in case. Enjoy your exploration of Costa Rica!